Preventing EFCC from arresting Ekpeyong, Oke is obstruction of justice – SERAP – Royal Times of Nigeria. 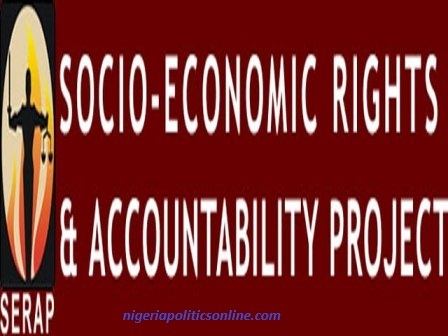 The Socio-Economic Rights and Accountability Project (SERAP) has urged President Muhammadu Buhari to intervene in the rivalry between the Economic and financial Crimes Commission (EFCC) and the Department of State Services (DSS). It could be recalled that the DSS had prevented the anti-graft agency from arresting Ita Ekpeyong, former director-general of DSS, and Ayo Oke, sacked director-general of the National Intelligence Agency (NIA). In a statement on Wednesday, Timothy Adewale, deputy director of SERAP, said by preventing the EFCC from arresting Ekpeyong and Oke, the DSS and NIA obstructed justice. “Preventing the arrest of a former director-general of the Department of State Services, Mr. Ita Ekpeyong; and a former Director-General of the National Intelligence Agency, ambassador Ayo Oke so that they are unavailable to answer the charges of corruption against them amounts to abuse of power and obstruction of justice. It is patently contrary to Nigerian law and international standards such as the UN Convention against corruption to which Nigeria is a state party. “Obstructing the work of anti-corruption agencies is a text-book case of interference with the orderly administration of law and justice, which can send a particularly damaging message that the government may not be truly committed to the fight against corruption. This may in turn affect the government’s whistle-blower policy and discourage the public from coming forward and providing the authorities with useful evidence of grand corruption.